I was looking for an improved Mexican Rice recipe, so I adapted this one from the America's Test Kitchen cookbook. I used many of the same ingredients, but instead of baking it, which seemed like a waste of energy, I finished it in my rice cooker. The result was a very flavorful and wonderfully textured mexican rice. Browning the onions and rice in the oil gives it a nutty, yummy flavor. My kids commented that it was "way better" than what they normally get in a mexican restaurant. I consider that high praise. As you'll see below, from the link to my Mexican Loco Moco Recipe, I made enough to use the next day for a delicious breakfast dish. We almost always use a 50-50 mix of brown and white rice, which I think works great in this dish. But feel free to use all brown or all white as you please. Heat the oil in a large pot or dutch oven ove medium heat. Add the rice and saute for 1-2 minutes, then add the chopped onion and saute together, stirring occasionally, for about 8 more minutes until light golden. Stir in the garlic and the minced jalapenos, leave for 30 seconds, then add the tomatoes and juice, broth, water, tomato paste, and 1/2 tsp salt. Stir well. Pour all of the contents of the pot into your rice cooker and set to regular or quick cook. When the rice is done, fluff it with a fork, fold in the fresh cilantro (and some fresh chopped jalapeno if you want even more kick), and serve. Yum! 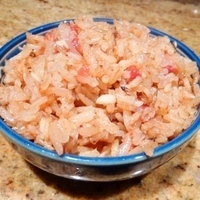 We've been looking for a flavorful mexican rice recipe as our youngest son loves it. This is a keeper! I too make my rice in a similar way. Im always looking for a new bean and rice recipe. It's funny how a little change in seasoning or choice of rice can make a big difference. Can't wait to try this. Now I wish I hadn't gotten rid of my rice cooker years ago.